The incident occurred near the border between Londonderry and Donegal. A police officer was forced to jump out of the path of a speeding van that mounted a kerb to dodge a stinger device near the border between Londonderry and Donegal on Sunday, the PSNI have confirmed. Strand Road PSNI stated that the officer narrowly escaped death when the driver of the van failed to stop at a police checkpoint. The PSNI were supporting colleagues, An Garda Síochána, who had a busy weekend policing the hugely popular Donegal Rally between Friday and Sunday. Officers revealed that the driver of a White Vauxhall Combo van failed to stop when signalled to do so at Coshquin and travelled on towards Bridgend where it soon came to the attention of the Gardai. “It fled over the border. 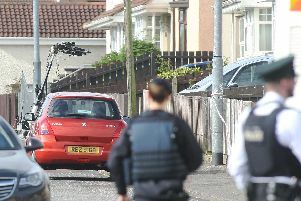 Gardaí chased it back into the North along the Coshquin Road,” the PSNI stated. When a stinger spike strip was deployed the driver provided a textbook example of criminal motoring madness. “The van mounted the verge at speed and narrowly missed knocking my colleague down,” an officer stated. The PSNI confirmed that the van was later recovered by Gardaí with just two tyres. “Our lucky stinger operator seemed to get the job half done as he was jumping out the way,” police confirmed. Meanwhile, Gardaí in Letterkenny confirmed 82 people were arrested over the big Donegal Rally weekend. While many of the arrests related to public disorder (46), drugs (five) or were made under the Mental Health Act (two), there were many incidents involving suspected road traffic offences. For example, 18 people were arrested on suspicion of dangerous driving with a further 10 suspected of drink driving. Gardaí said that were a number of reported incidents between Letterkenny and Bridgend. At 11.30 p.m. on Friday evening there was a reported instance of dangerous driving in Newtowncunningham. On Sunday there were similar reported incidents at 4.30 a.m. in Burt and at 11.30 p.m. in Manorcunningham.